Strongly recommended if Animal has had a past 6 mo. history of Antibiotics, NSAID or Heavy Pharma. Strongly recommended to be mixed at WELL Amount with Doggy GOO / STRESSed / Allergy for duration of GOO Gut Rescue Container. A 16 oz. Container of GOO = 90 TeaSpoons. The # of Days Supply depends on your DOG’s Weight and whether your Animal is “ Well “ or “ Stressed “. Please Review FEEDing Instructions Site Page for further Details. Often Itchy Allergy Dogs have had a Past History of Heavy Pharma, Steroid Use and/or Antibiotics. If this is the Case, Healthy GOO has found ( in our opinion ) that your Animal’s GUT Biome “May” by Bad Bug Compromised / Dominated. If this Occurs, not only does this condition compromise Daily Food BreakDown / Absorption, but ( in Healthy GOO’s Opinion ) an Out of Balance GUT-Biome can appreciably Impede the Progress of Doggy GOO’s Enviro Allergy Fight. “If ” You feel that this might be the case with your Animal, or if You want to take Pre-Emptive / Pro-Gut-Biome Measures, Healthy GOO recommends that GOO Gut Rescue be Mixed ( @ a WELL Amount ) into the STRESSed Amount of Doggy GOO. This will “Rescue” your Animal’s GUT-Biome and needs only to be continued for 1 Jar of GOO Gut Rescue. After which the Pre & Probiotics in Doggy GOO “should” be sufficient to carry on thereafter. 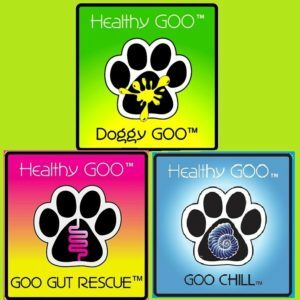 Policy Statement: Because of the Ingredient Profile and unique Health Focus of Health GOO’s Product’s, Healthy GOO cannot offer any Guarantee / Return or Refund. Pet Parents are asked to Call Healthy GOO / 855-246-2426 with Any GOO Questions before Purchase. 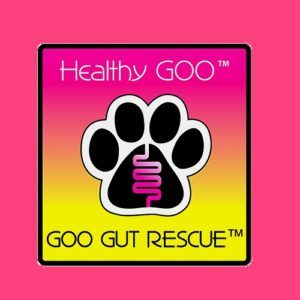 GOO Gut RESCUE: Rescue / ReStore / Repair / Retain / ReSolve GUT / GI Health & Balance. Plus Build Tolerance to 7 Provocative FOODs. Qty 1 – 16 oz. Container of GOO GUT RESCUE A 16 oz. Container of GOO = 90 TeaSpoons. This may translate to 90 Days Supply depending on your DOGâ€™s Weight and whether your Animal is â€œ Well â€œ or â€œ Stressed â€œ. Please Review FEEDing Instructions Site Page for further Details.